Joshua has been wanting a BB gun for about a year or more. Sunny and I finally decided that this Christmas was the perfect time. The box kinda gave it away — he guessed what it was as soon as he saw it “under” the tree! But no matter; it was the first gift he ripped into on Christmas morning and by that afternoon we were out in the yard testing it out on a cardboard “orc” target we’d created. 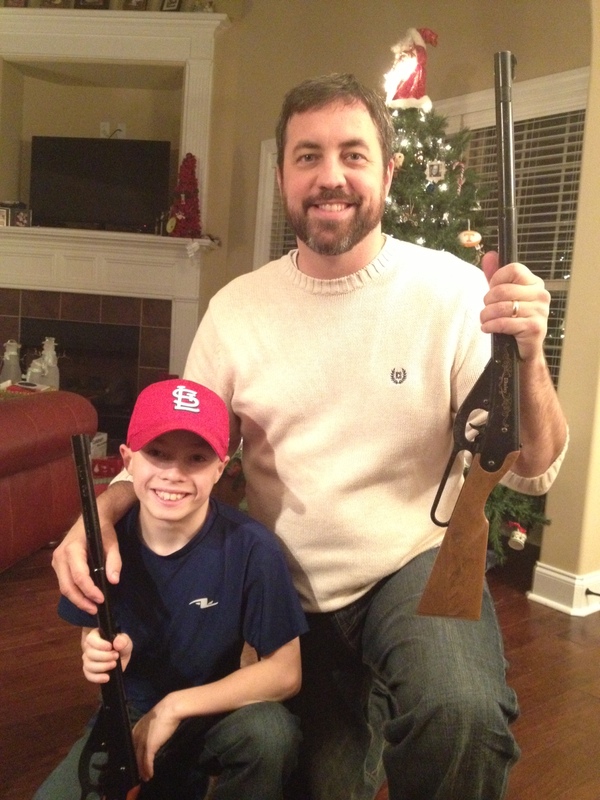 We even dug out my old BB gun that I got from my parents about 30 years ago. I put a few BBs in and shot it a few times….and nothing happened. But after a couple of “warm up” shots, it worked just fine. We had a couple of hours of fun killing orcs and learning about gun safety. It was awesome. The reason we chose to shoot at orcs? Christmas break also marked the first time for my kids to see the Lord of the Rings trilogy. I’ve been wanting to introduce them to LOTR for a year or so, but we thought Jackson was too young until recently. Over the last few days, we’ve made our way through all three films and I’m once again reminded of what an epic storyline Tolkien created. Joshua’s favorite is Legolas; Jackson vacillates between Frodo and an elf warrior; and Abby Kate pretends to be Arwen. For the last few years, I’ve had to answer all sorts of Star Wars mythology questions; now we’ve moved on to Tolkien, which I know very little about. I just know these movies are awesome and it’s been a blast watching them with my kids. One of the things Abby Kate has been asking for all year is a guitar. At first we hoped it was just a fad, but she stuck to her guns all year long. Luckily, a good friend was willing to help us pick one out that would be “just right” for little fingers as we learn how to play. A few days before Christmas, our friends stopped by and surprised her with this special gift. The grin on her face was about a mile wide! Of course, her brothers have already “untuned” the guitar (that didn’t take long), so we know there will be plenty of things like this we’ll have to learn along the way. But I’m thinking about signing both of us up for guitar lessons; I think that’d be a really fun thing for us to do together. Jackson has especially enjoyed the whole “Santa” thing this year. Part of Santa’s routine around here is dispatching an elf — Ollie — to come to our house the day after Thanksgiving. Ollie appears every morning in crazy places throughout the house, but thankfully he’s not one of those mischievous elves. Each morning, Jackson rips through the house to be the first one to spot Ollie. He left him a few notes this year, things to pass on to Santa. They were sweet notes, asking not just for presents for himself but being sure to mention a few things his brother and sister wanted as well. Jack also wanted us to be sure to have enough milk and cookies out for Santa and he gave his mother and me strict orders not to stay up too late…he didn’t want us to scare off the big guy as he made his way down the chimney! This year we made it a point to see more Christmas lights than ever before. That led us to Tinsel Trail in Huntsville; Horseshoe Bend near Grissom; the Botanical Gardens; and the Opryland Hotel. Lots of fun family memories! This entry was posted in Blessings, Christmas, Family, Huntsville, Kids and tagged BB gun, Christmas 2013, Christmas lights, Lord of the Rings. Bookmark the permalink.